BlackBerry Curve 8900 appeared on Research In Motion’s German BlackBerry website. It is then followed with a press release by the company. BlackBerry Curve 8900 packs a 65K color landscape TFT display with the nicely sounding resolution of 480 x 360 pixels. It has quad-band GSM/GPRS/EDGE support as well as Wi-Fi connectivity and a built-in GPS receiver. Some more details of the Curve 8900 has been revealed, including support for DivX, Xvid, and H.263 video playback. The Curve also comes in Bold’s 3.2-megapixel camera. 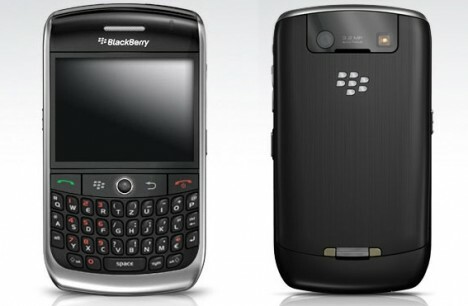 Bluetooth and USB are also on board the BlackBerry Curve 8900. The Curve 8900 will be powered by a huge 1400 mAh battery which should give impressive power autonomy. The targeted availability of the handset is November 2008 but its pricing is yet disclosed. Dimensions (H x W x D) 4.3×2.4×0.5 in.